When Hattie and Jamie first approached us, they mentioned a vision of a smart classical white wedding in the Bramptons of Northamptonshire. 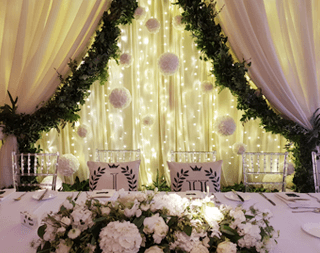 After an initial meeting to discuss how we could create the look, we asked them the details of the wedding and what gave them these ideas, as this really helps us when figuring the best way to take a room design. 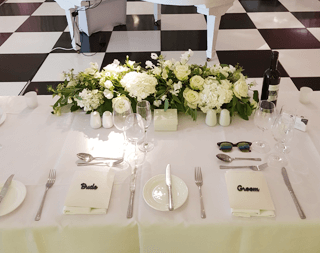 They are keen gardeners too, so greenery was key, eucalyptus being a favourite and so beautifully fresh and fragrant in a room of clean linen. We discussed a warm pea light backdrop to the top table incorporating wild eucalyptus and floating white rose pomanders, warm festoon lighting to the marquee ceiling, ghost chairs (crystal clear and a real American favourite at the moment), spotlighting to the tables and timeless floor length white table cloths. 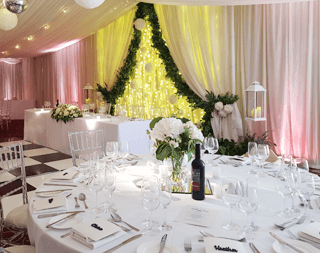 To add some atmosphere to the wedding, the wall colour wash was chosen in a light blush, the colour was called ‘rosebud’ and the candles on the tables added a lower table level glow. 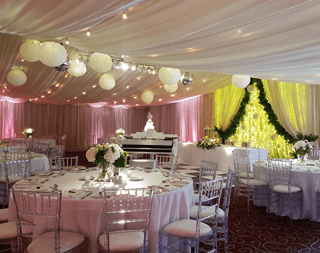 To finish it, we added some simple white lanterns to the ceiling, tall freestanding lanterns on ghost plinths to the side of the top table and a glossy black and white dance floor with a slow rotating mirror ball above. 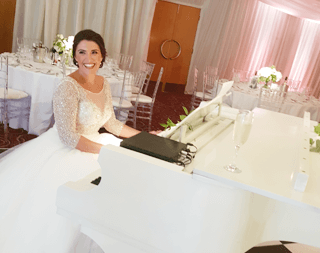 The bride, Hattie, plays the piano – and has done for many years, her husband to be said how good she was and they fondly shared memories of family gatherings around the piano… this confirmed to us what we would use as a ‘cake table’. 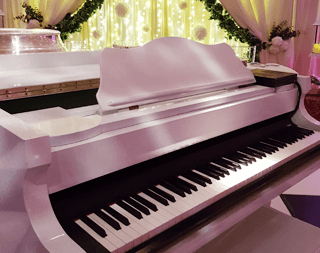 A sparkling white baby grand. 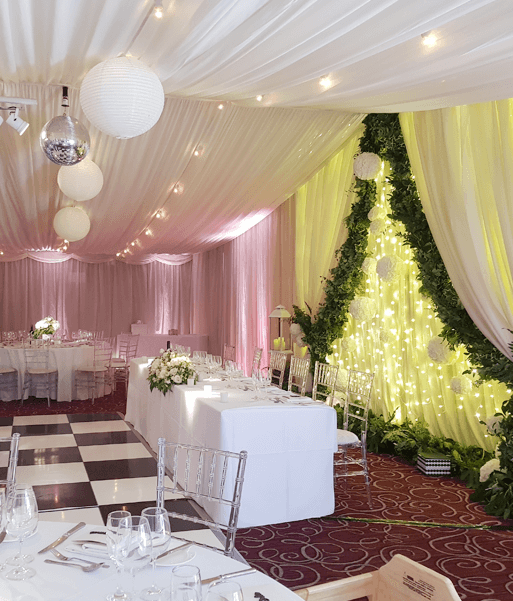 Added to the centre of the dance floor, it finished the look beautifully and made a real statement to the room, we were going for elegance. Hattie and Jamie’s faces, when they walked into the room were a real treat and the reason we work so hard to deliver. 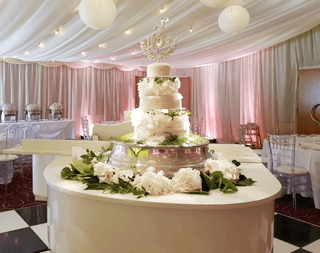 They told us several times how much they loved it and we couldn’t ask for better than that. 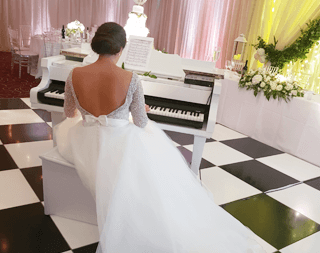 Hattie even gave us a little tinkle on the ivories and we were told by the wedding planner that she did a little performance with her dad in the speeches too! 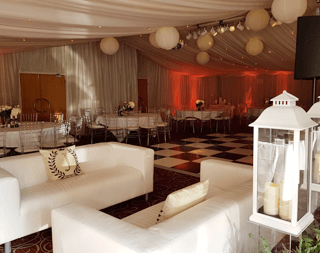 We returned in the evening to add some white sofas for a more relaxed area beside the dancefloor, and changed the colour wash to a deep amber, called ‘candlelight’ so they could really party on till the early hours. 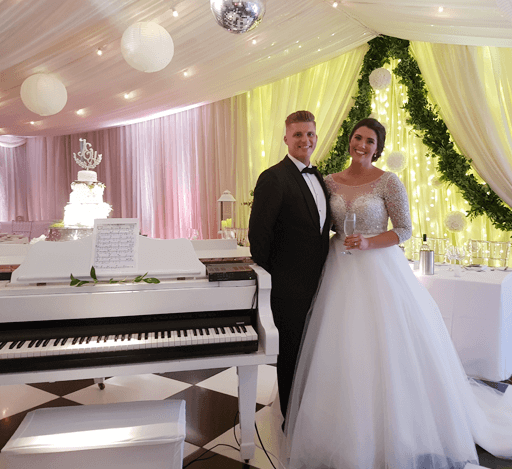 We left them practising their first dance to ‘Your Song’ and hope the rest of the evening was just as magical as the day.